I wanted a DOT approved half helmet that was simple. I didn't realize this had a internal visor until I got it. The optional ear and neck pad is a feature for when its cold out and helps keep the wind noise down. I have bought this same Helmet before. It is just what I like,and fits my needs. I HAVE THIS HELMET AND WAS GETTING A SECOND FOR MY WIFE AND ONE FOR A FRIEND THAT HAS BORROWED MINE IN THE PAST AND LIKED IT. low profile, reasonable price, will look good with my Road King. Because I wanted a 1/2 helmet. I wanted a second helmet on my month long annual road trips. I usually wear my Bell 500 3/4 helmet but a half helmet is a great change of pace occasionally. Because it was the only helmet, that looked like what I was looking for with a solid color, no multiple colors. Looks good and doesn't cost a fortune. Needed something that would qualify as helmet for my noggin. It had to be simple and provide some level of protection without being beefy. I wanted some great helmets for summer riding and they say these stay cool. I already have another one. Needed something more than a shell that performs, is comfortable and looks great. For streamlined look protection with out the bobble head look. Look and vesatilaty for summer riding. I need it for my rider coaching in MSF. Picked this item as it was simple with no design work on it. I also like who the straps look wider, hoping they won't cut into my face as much as thinner straps. A friend has one!! Me likey!! I have purchased gmax helmets previously and am very pleased with the products. 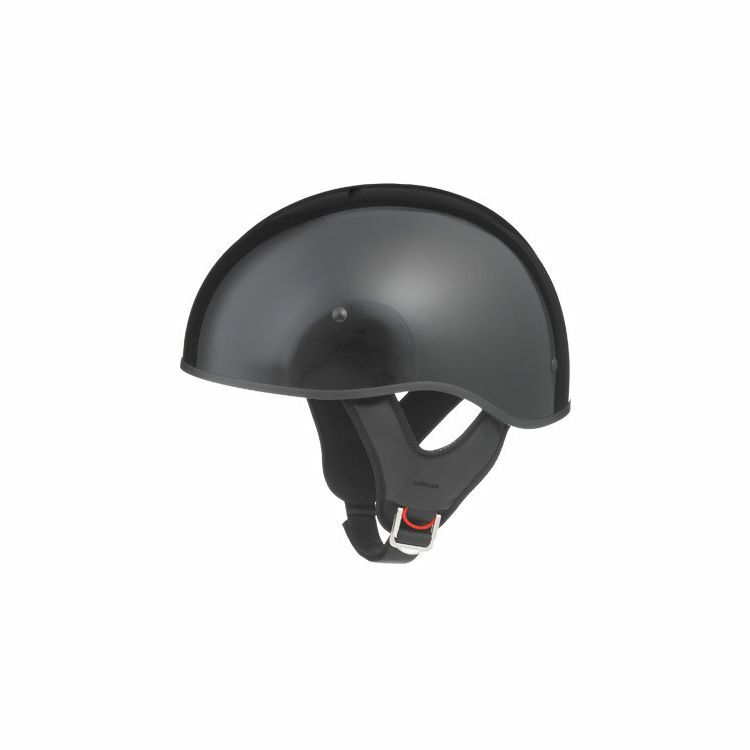 This is a spare helmet that will be plain and simple and dependable as always. How much does the medium weigh? BEST ANSWER: Mine is right about 2 lbs even. Does this helmet come with a visor above the drop down visor thats attached to the shell of the helmet? such as in the full dress model of this helmet. BEST ANSWER: Glad to be of help anytime. Unfortunately, no, the helmet comes only with the internal visor. Still though its a great looking helmet, very comfortable, and for me the internal visor was more than sufficient. Glad to be of help anytime. Unfortunately, No, this helmet comes only with an internal visor, but still has a great fit, and for me its more than enough as a summer helmet. The helmet does not have, nor is fitted for an outside mounted visor. Designed to be simple and clean, without additions. No. The front of this helmet is smooth, no visor or lip protruding as the image depicts. Yes, it attached to the shell, I barely remember that there is a visor "inside"
No, only the drop down visor(s). BEST ANSWER: Yes, it does come with a retractable sun shield. Not a big fan of the shield though as it is to close to my face. Yes it has the clear and tinted shield. BEST ANSWER: Yes it is DOT approved. This is a great helmet, fit and finish also great! Yes, it is DOT approved. I'm wondering if the GM65 will be too tight on my 23.75" head of normal proportion. The chart says 23.2-23.6 for large and 24-24.4 for XL. What about 23 3/4? BEST ANSWER: Don't know. It was a gift. I used the guidelines and it fit perfectly, but I think it was an xs size. My head is 23.75 so I went to the next size up and it fits great. What is the internal shape of this helmet? BEST ANSWER: Thanks for your input and advice John, I appreciate it. From what I can ascertain, it seems the GMax shape tends towards rounder, which would suit me, but everyone's experience differs, of course. Are you wearing the XL size? Does it seem to run true to size for you?